The Municipal Gallery of Athens is the principal public museum in Greece’s capital city. It houses a diverse collection of nearly 3,000 works from leading 19th and 20th Century artists. The building was donated to the City of Athens in 1993, and in 2007 restoration work began. The new Gallery opened to the public in October of 2010 on the corner of Myllerou and Leonidou street adjacent to Avdi Square in Metaxourgeio. 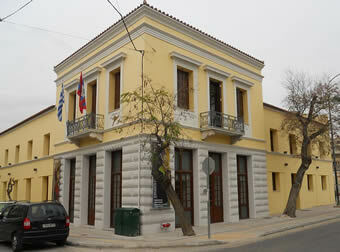 The move added another dimension to the gallery’s draw, as its current building was designed in the early 19th Century by prominent architect Hans Christian Hansen and built in the bohemian enclave known as Metaxourgeio in the heart of Athens, having relocated to its new home from a charming but much smaller building on Koumoundourou Square. The Municipal Gallery of Athens houses a rich collection of nearly 3,000 works from leading 19th- and 20th-century Greek artists. Big names of the collection include George Iacovidis, Angelos Giallinas, Vincent Bokatsiambis, Nikos Litras, George Bouzianis, Constantinos Parhenis, Gerassimos Steris, Agenor Asteriadis and Yannis Moralis. Contemporary artists include Opy Zouni, Chronis Botsoglou and Makis Theofylaktopoulos. The gallery's other standout offerings include a series of engravings by the masters and their worthy followers, along with sculptures and architectural drawings of neoclassical buildings by Ernst Ziller and Theophilus Hansen.